The premium scooter market in India is a strange, rather lonely place. The first scooter to really sit in that space was the Kinetic Blaze with its big bad looks and 165cc engine. But after an initially warm reception, the word of its reliability hassles and poor quality got out and that, was the end of that. And now we have only the Italian scooters from Vespa which arrived in 2011 and opened up that market segment again. 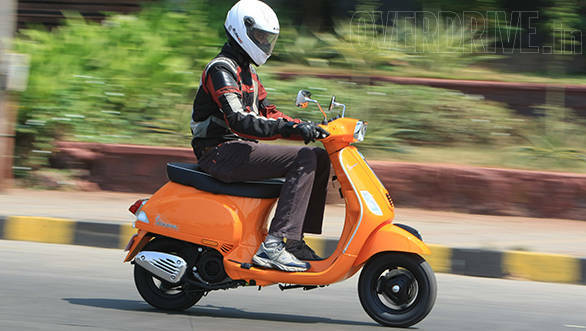 The LX125 came wearing the same equipment as any other scooter in India but a price tag roughly 40 per cent higher than them. Its sales numbers reflected this situation despite it being a rather likeable, well-made, distinctly good looking scooter. Sales went up when the prices came down a bit, underlining how critical the price issue really was. Then came the VX with its disc brake et al and the price shot right back up. The company, through all this, stood its ground saying that it didn't want to be in the price game and that their Vespas were luxury scooters and priced to that end of the market, with its naturally smaller sales. Now, Vespa starts the sales of its third scooter on the same platform, the S which has the unique distinction of being the most expensive scooter on sale in India right now. Why is the price so high? We rode the scooter to try and understand this. It is every bit a Vespa, even from afar you can tell that this beauty has come from Italy. We had enough passers-by asking us about the new scooter, especially the hard to miss orange coloured one. This and matte black are unique options on the Vespa S - you can also get one in red or white. Colours aside, the S is distinguished from the Vespa VX only by its styling, specifically, the rectangular (seventies-style) head lamp and the rear-view mirrors. Vespa will also offer you an optional screen (price TBA) that looks rather cool though it serves no purpose functionally. 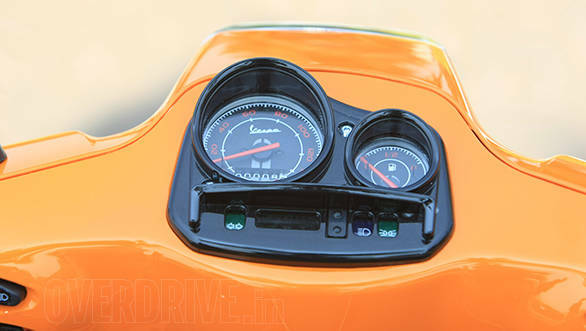 From the saddle, you notice that the speedo and fuel gauge are housed in separate pods. While the overall finish of the scooter is better than what we have seen on Vespas before, the switchgear isn't still the best. The switches are not very ergonomic - one has to nearly take the hand off the handlebar to operate the horn. The S gets cubby holes on the apron which is a nice touch though the lockable little cubby on the Vespa is probably a more useful feature. Between the cubbies is also a foldable bag hook. Like all Vespas, the front apron gives way to a floorboard which has a distinct spine in the middle which means it isn't very useful because anything you put there tends to fall out as soon as you stop. However, Vespa has worked on the seat unit which is noticeably more comfortable. The contrast stitching is really neat too. From the seat, the Vespa, as expected is a spacious scooter and six-footers will face no problems with the knees and the handlebar. However the S doesn't come with the grab rails that its siblings had. Instead the pillion gets a strap. Piaggio says the grab rails are optional accessories (Rs 3500 for a set of guards and mats including the grab rails in Mumbai). Underseat storage in the S is decent and can fit in an half face helmet with ease. The pillion will have to buy his/her footrests, again as an accessory (Rs 800 in Mumbai). The Vespa S and S125 logos on the side are done tastefully. The familiar 3-valve 125cc with its 10.06PS and 10.6Nm powers the S. It is currently Vespa's sole engine in India. the S feels smooth and refined and climbs easily to 80kmph after which acceleration slows a bit. Piaggio says 60kmpl or more is possible on the S.
We've liked the LX125's handling and ride from the off, and the S is more of the same. 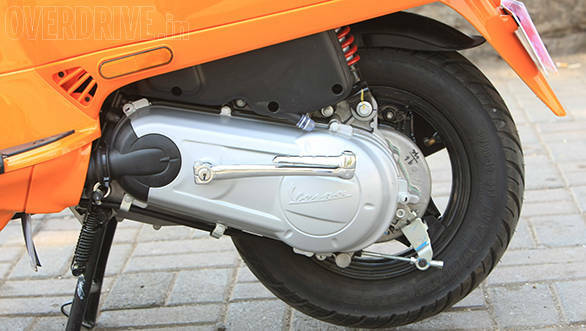 It runs Vespa's usual trailing link front suspension and a single shock absorber at the rear, exactly the same as the Vespa VX. Even two-up the S displayed good stability and confidence around corners. The brakes again like the VX, are some of the best we have seen on Indian scooters and stops are effective and short. The Vespa S, as Ravi Chopra, MD of PVPL (Piaggio Vehicles Private Limited) puts it, "is more for the influential youth". The company doesn't expect the scooter neither to rake in the numbers nor compete with other 125cc scooters. Roughly available for the on­-road price of two Scootys or indeed, a Pulsar 180, the Vespa S is extremely expensive. However, India is not as much price sensitive as it is value sensitive. The issue we continue to have with the Vespas - which are otherwise tremendously satisfying scooters to ride and own - is that the price premium seems to be for image alone. For the price, you should get more stuff. Like fuel injection, like a lot of bits that you have to pay extra for as accessories. Stuff that suggests premium equipment comes with the premium pricing and makes the value proposition more attractive. But hold on to your hats. 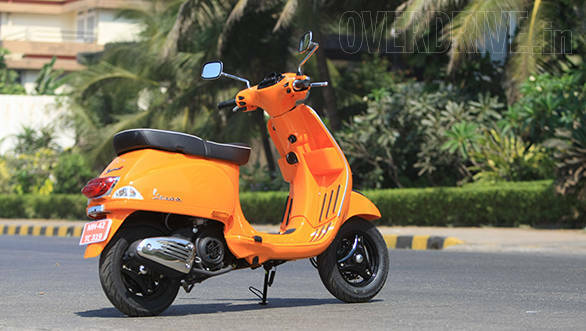 Vespa is now working on the 946 for Indian launch and that really is a thing of utter beauty. A more desirable scooter we have never laid eyes on. And if you think the Vespa S has a price tag as tall as building, the 946 will be bring you to tears. 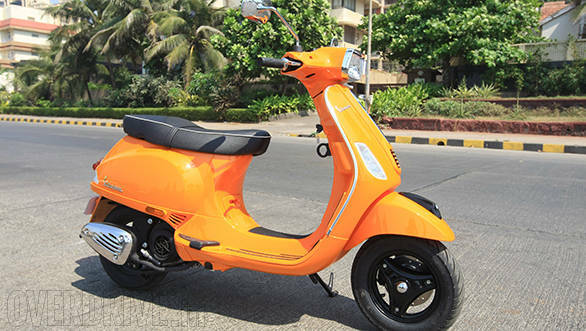 The Piaggio Vespa S is available for Rs 76,495 ex-Mumbai. The Suzuki Access 125 which is also a 125cc scooter in the meanwhile is priced at Rs 56,413 on-road Mumbai.